Jeff Clark is best known for surfing Mavericks and big waves across the world. But as a third generation carpenter, Jeff has a passion for innovation and building new designs in surfboards, safety and all things his mind can create. This drive began at a very young age when helping his father at construction sites, and later as he became fascinated with the way water moves across a surface. He built his first surfboard at the age of 11, and his first big wave gun at age 18, since no big wave surfboards could be found around Half Moon Bay that could take on the massive wave he was determined to surf. Jeff holds a US Patent for surfboard design, and has several innovative fin and board designs that are now commonly followed in the surf industry. These days, you will often find Jeff pursuing his latest passion, foil surfing. Jeff and friends Travis Pynn, Chuck Glynn and Nick Nayfack have create FoilScience, a company dedicated to the research and development of high performance, next generation hydrofoils for surf and stand up paddling. FolScience is in the early stages of R&D, but clearly the group is having a great go at the "research" part of their venture (see video below of Jeff Clark, courtesy of @jamy_donalson_air on Instagram. Watch for more adventures from this group and their innovative designs that will take foiling to new levels. Perhaps Jeff's most important safety innovation has been his Inflatable Life Vest. Jeff had flirted with the design concept more than a decade ago during the days of tow-in surfing at Mavericks. Traditional flotation devices were critical to tow-in surfing, but didn't provide the versatility needed when prone paddling. When jetskis were later banned at Mavericks and throughout the Marine Sanctuary, the need for life-saving technology became even more critical. He worked on designs for flotation, infaltables and even new designs for head protection. In 2011, he developed his first drawings for a big wave inflatable life vest. He contacted several manufacturers, and later teamed with Quatic® (then known as FloatTech®), as they hold the patent in the inflatable technology he felt was critical to success. Working with the Quatic® team, Jeff developed and tested several prototypes, and launched his first Clark Inflatable Life Vest in 2013. The design continues to improve with feedback from surfers, paddlers, kitesurfers, kayakers and sailors around the globe. Always improving the design and fit, Jeff is committed to providing the best materials and on-the-water experience for those who like to push the limits. Simple solutions he sees daily, such as a reusable pin that prevents plastic from littering our oceans, make this an exceptional, responsible life-saving aid and the first of its kind to hit the consumer market. The inflatable life safety vest combines life-saving technology with comfort and functionality. This low-profile, two-stage life vest has been designed with athlete input for maximum mobility, performance and protection to encourage more frequent use by surfers, paddle boarders, kayakers and other water sports and ocean enthusiasts. And because rough water and extreme waves may lead to emergency situations where less buoyancy can be an advantage, it lets you regulate your flotation. 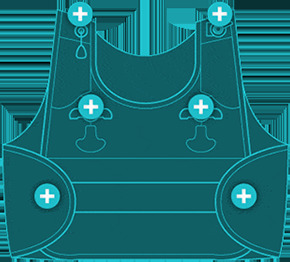 Once deployed, the vest reaches maximum flotation instantly to provide exceptional buoyancy both front and back so that once you reach the surface, your head and airway are upright and out of the water. A discharge cord is easily accessible for immediate deflation, allowing the surfer to regain control and paddle away to catch more waves. Reinflation is as simple as pulling the second rip cord when the danger has minimized (or fatigue sets in). The vest is worn externally for easy access over a wetsuit or rash guard, allowing a quick change of a cartridge without climbing out of your wetsuit or requiring another person's assistance. The vest comes equipped with an oral inflation tube to allow the user to control inflation to a preferred level without deploying the cartridge. New updates to the vest include military grade fasteners, a lower profile fit, and reusable pins that don't discard plastic into the ocean. Our latest testing includes grab handles for rescue and other advances thanks to feedback from athletes worldwide.